Hi, documentary club, thanks for coming back to discuss Small Potatoes: Who Killed the USFL (and if you haven't seen it yet, watch it here). In the film, Donald Trump unequivocally states that "if God wanted football played in the spring, he wouldn't have created baseball," but apparently there were enough football loving heathens out there to scrape together the United States Football League, better known as the USFL, in 1983. But as quickly as it came into being, it was gone. The league was officially defunct by 1985, after merely three seasons. So what happened to America's second-most popular football league? 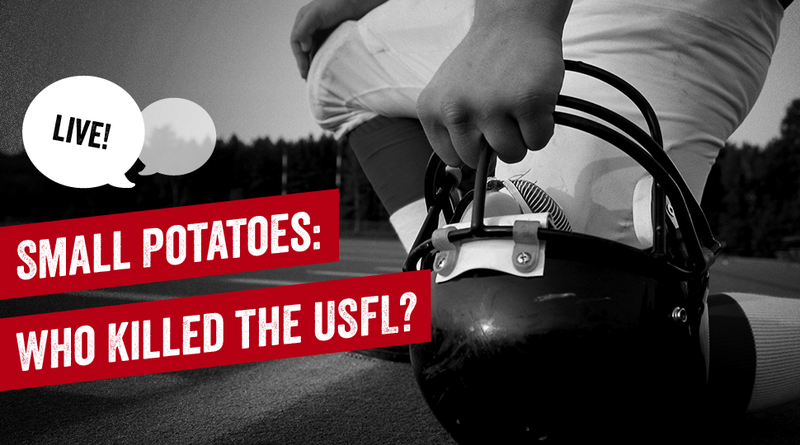 What sized potato was the USFL? Let us know in the comments below! 1. Even without Donald Trump's meddling, do you think the USFL would have survived? And do you think two competing leagues would be viable in today's football culture? 2. A handful of pro-football games have taken place in the conditions reminiscent of the Arctic Tundra over the past few weeks — so why don't they play football in the spring? 3. Although already used in college football and other leagues before the merger, pro-football didn't adopt the two-point conversion until 1994. Did the USFL increase the two-point conversion's appeal? Also, does the current red-flag challenge system owe its thanks to the USFL? 4. I was aware that Doug Flutie, Herschel Walker and Jim Kelly had stints in the USFL, but Reggie White and Steve Young were both surprises. Anyone else learn something new? 5. New Jersey Generals! Boston Breakers! Bandit Ball! If you could create your own USFL team what would you name it? To be topical, I'd go with the St. Paul Polar Vortex. 6. $3.76 is what was awarded to the USFL after they won their lawsuit against the NFL. What would you buy with $3.76? 7. If given the choice, which league would you rather revive: USFL or XFL? Documentary Club is a recurring feature in which we watch and discuss the finest documentaries available to stream on Netflix. Join in the discussion, because we have more intensity than a Richard Sherman post-game interview.